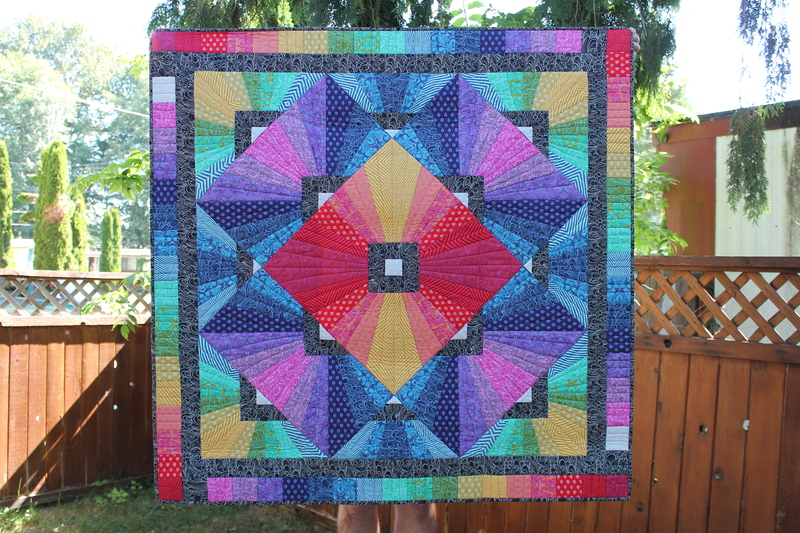 Waaaaaaay back in July, I finished up and sent off my Hoffman Challenge Quilt. 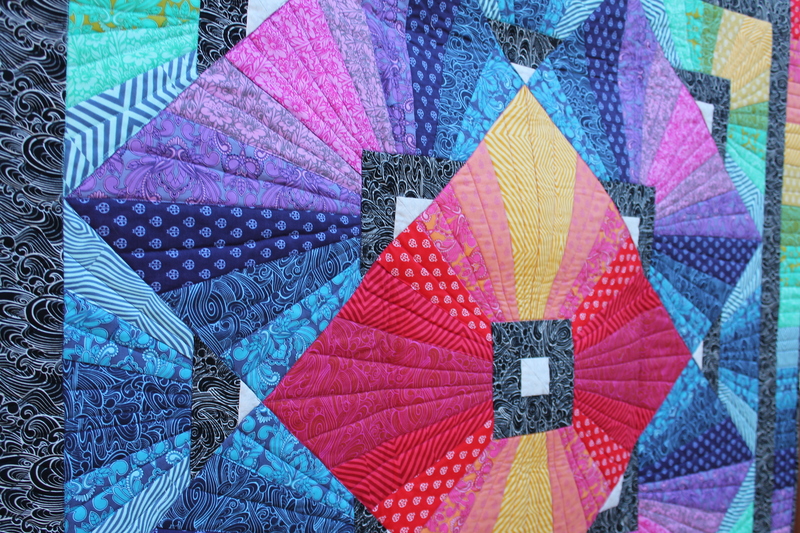 for the first time ever, my challenge quilt was finished and mailed more than three days before the deadline. Did you know it’s way less stressful to send things before the deadline? Cuz I do now! Usually I mail so close to the deadline there is no time for pictures or ground shipping, its a 3-day or bust nail biting marathon of RUSH. So this year was an immense pleasure. 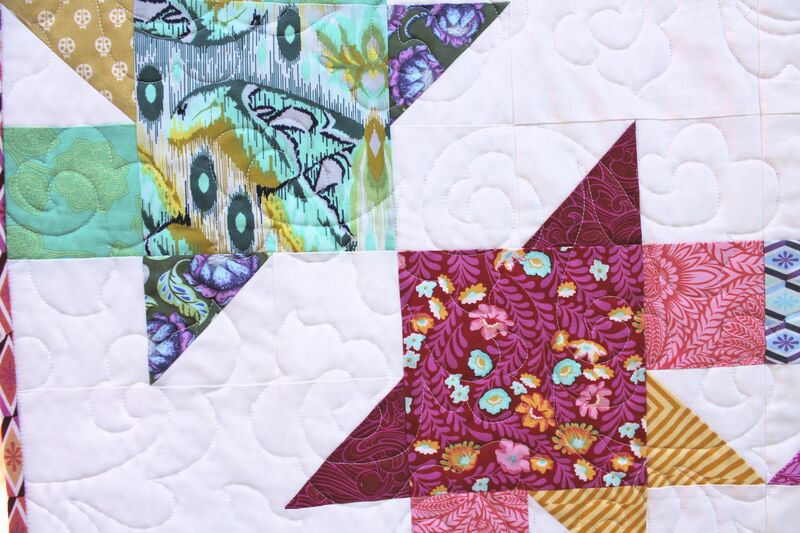 And, I also LOVE the quilt! 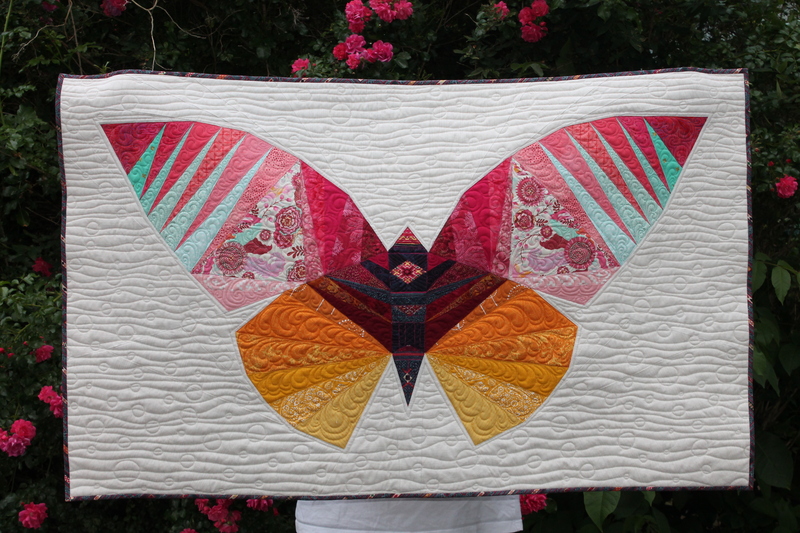 My quilt, Mariposa, is a super enlarged version of the Lillyella Stitchery “Take Wing” pattern. 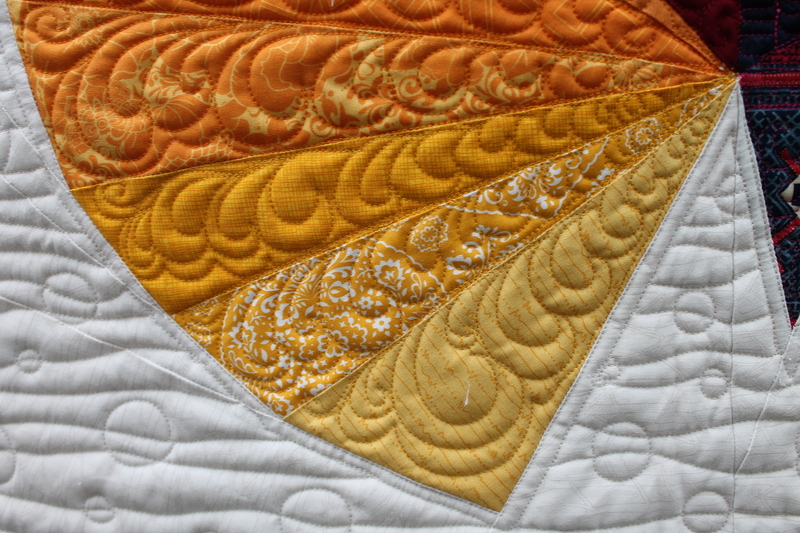 The original finishes at 18″x 24″, a perfect mini quilt size. My version finished at 35″x50″! 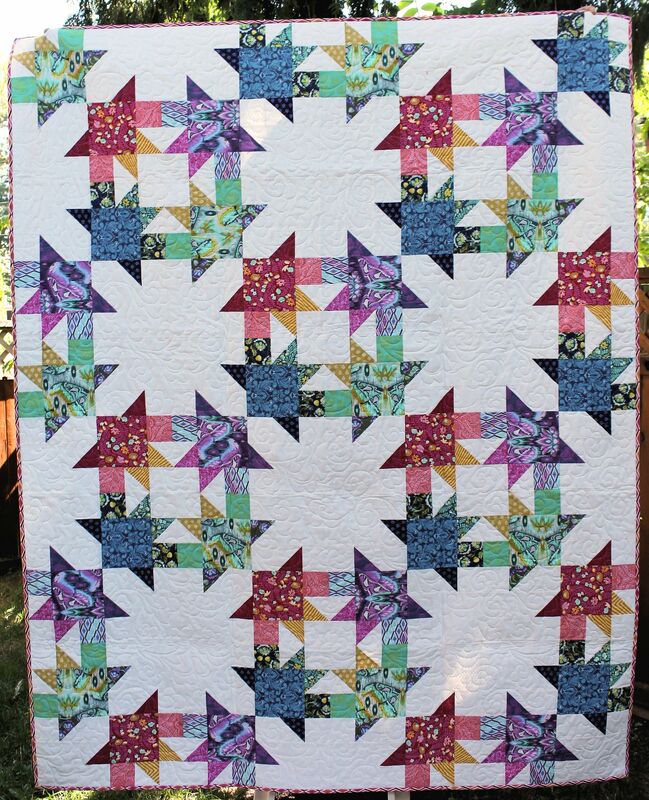 One of the biggest factors in finishing early was being able to quilt this on the longarm myself, and some excellent color and design advice/support from my friends. 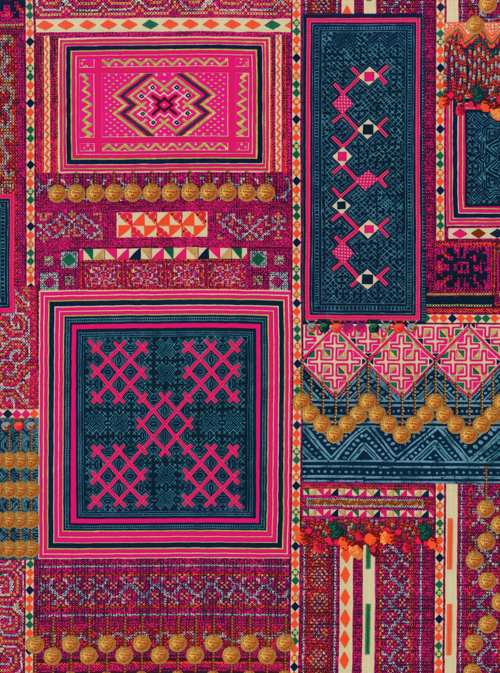 I agonize over color choices sometimes, and this was a doozy. There are over 32 different prints! I knew I wanted to play up the base colors of the Challenge Fabric. I was drawn to the bright fuchsia pink the most. Then I wanted to contrast and play with the prints until I had an ombre effect, with the body the darkest and the wings the lightest. 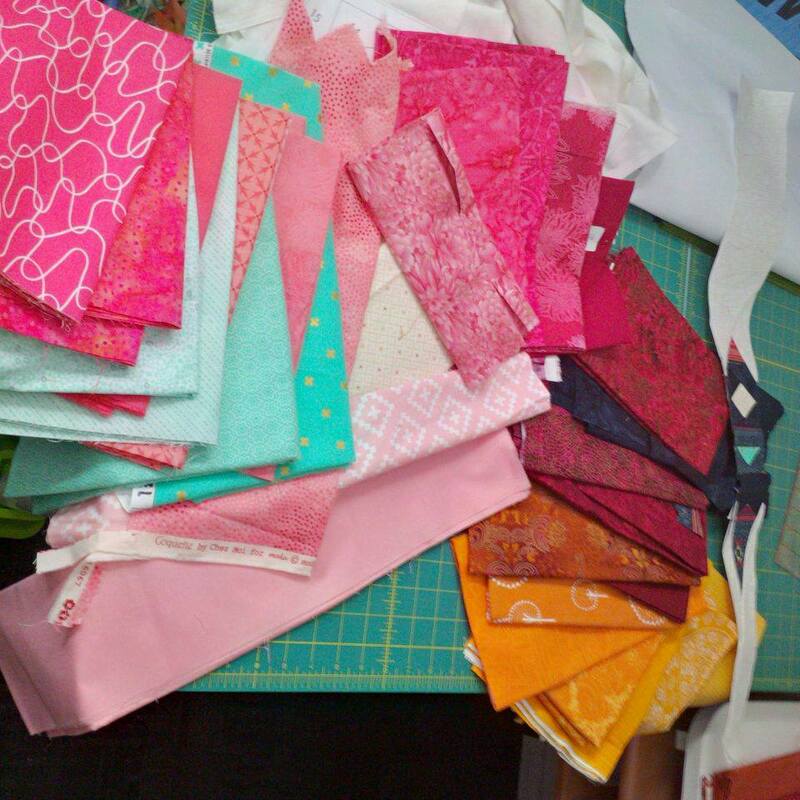 I pulled about 55 fabrics and had to start paring down from there. This was the last of about 15 different photos. Amy, Anne, Gillian and Kim (My QDAD peeps) were hugely patient and helpful in narrowing it down to this. And then I started sewing. First the body, because it was small and easy for me to work my way into. I fussy cut the different textured indigo areas of the challenge fabric to create different sections of the body, and threw in some of the prints. I used and indog Hoffman 1895 batik to make the textured pieces stand out. Next came the wings. I started with the bottom wings because there were less pieces,and the color gradient for that was a bit easier. i incorporated some more of the indigo into the wings to balance out the center. And then the big part, the top wings. 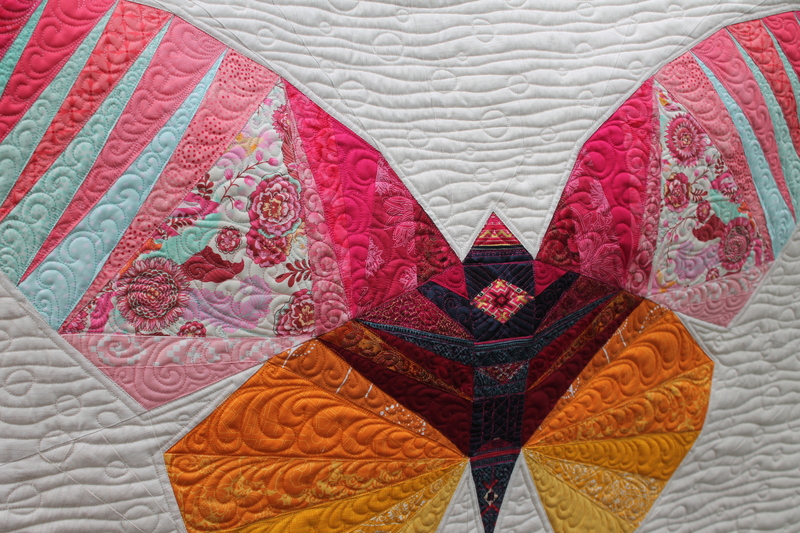 It took me a week to make each wing, because the pattern pieces were huge, and each section was very large. I don’t normally use pins when paper piecing, but I had to with these pieces. It helped keep the large pieces of fabric steady.There are a lot of bias edges, and some of the pieces were as long as 22″. I could only piece one or two sections at a time before it got too ungainly and I moved on to other things. But finally, FINALLY! I finished the top wing sections. And. I. hated. it. For a split second I panicked. 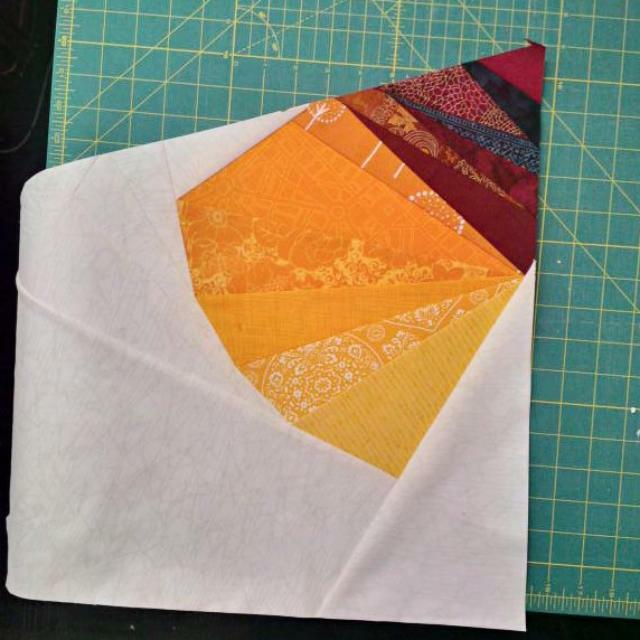 And then I remembered a technique taught to me at Quiltcon by Cristy Fincher, paperless paper piecing! Part of this technique involves glue baste and piecing from the outside in. So in that vein, section 1 would be the last section pieced. So with that in mind I removed some paper, firmly grasped my seam ripper, sent up a small prayer, and began some quilt surgery. Once the offending fabric was removed, I carefully grafted in the new section. I used the main print from Tula Pink’s Foxfield collection. I have tons of it, and it had both the pink and aqua accents in it. I fussy cut the fabric to show off my favorite parts. It worked perfectly, and I couldn’t be happier! 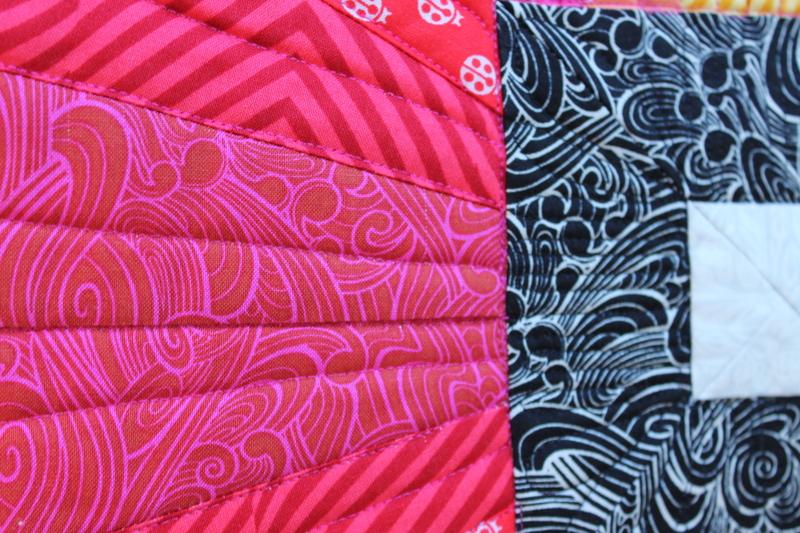 I then took my new sugical skills ot the body, where I replaced the accent fabric with more of the fussy cut challenge fabric. Then I took the quilt off to the long arm. I froze for a bit, I knew what I wanted in the wig sections, but the background had me stymied. 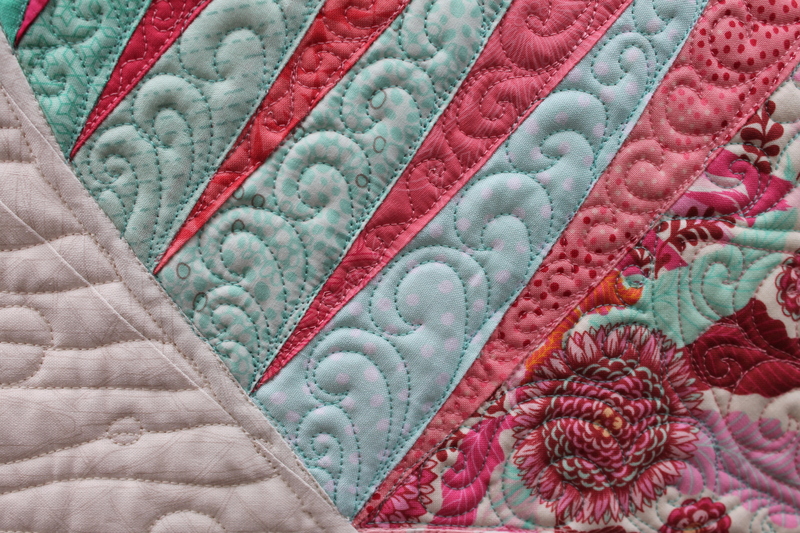 After a quick consultation with the amazingly talented Mandy Liens I outlined the butterfly and then used my favorite background filler from Christina Cameli’s book Step-by-Step Free Motion Quilting. 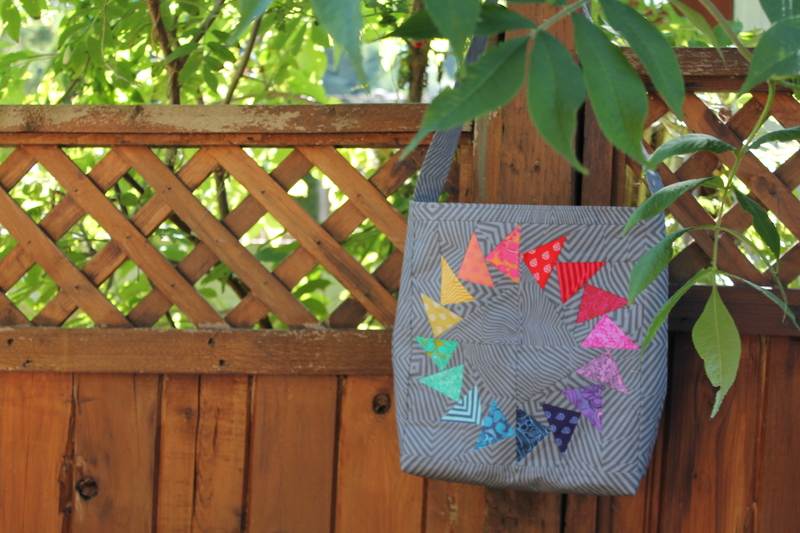 This particular design is called Effervescent. Its super simple,and super effective. Following Mandy’s advice, I made curled feathers. I love how they look like feathers, but don’t require all the back and forth outlining of real feathers. The body I had fun with. 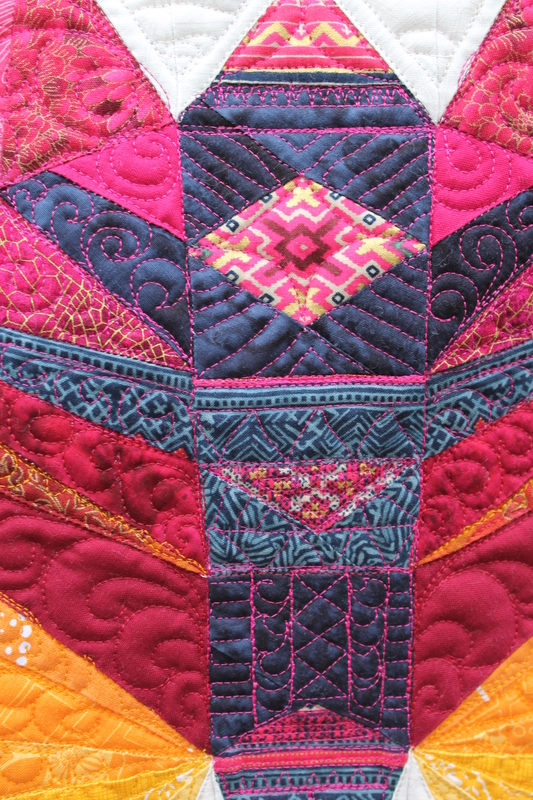 I used contrasting thread to create patterns and used mostly straight lines. SUper effective! 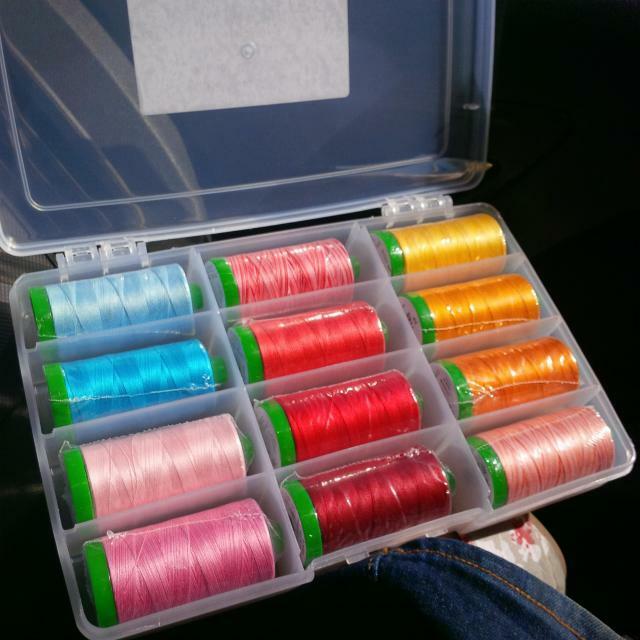 I used a custom box of Aurifil Threads that I picked up at a quilt show on the Sunshine Coast, from Carola’s Quilt Shop booth. I love that you get to build the box yourself from any thread in the shop! I mailed it off and waited. 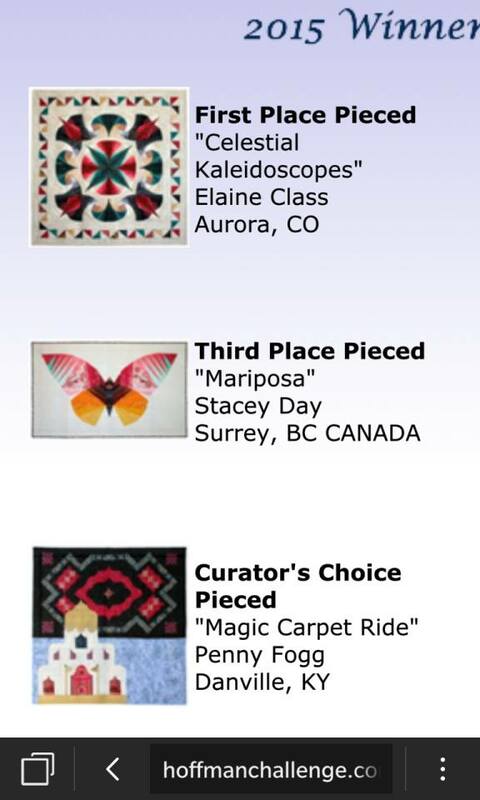 Then in late August the winners list was published, and there was Mariposa in Third place in the Pieced Category! I couldn’t believe it! I got this lovely ribbon (new for the challenge), letter, and two boxes of Aurifil thread as well as the participant packet of fabric and a beautiful enameled pin.